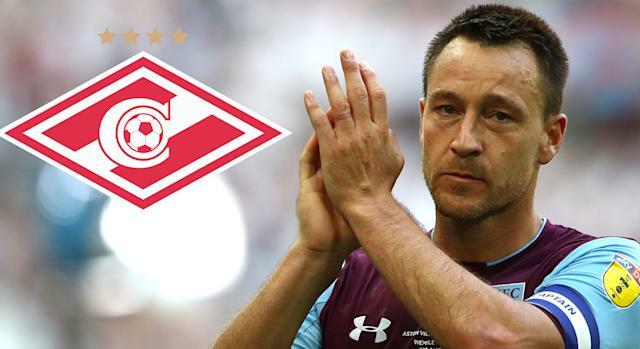 Former Chelsea star John Terry has passed up on the chance to play for Spartak Moscow, despite receiving a lucrative offer to feature in Russia’s top flight. Terry, 37, last featured for Aston Villa, where he spent last season in a failed bid to gain the Birmingham side promotion to the Premier League. He has been out of contract since the summer, and looked set to join Spartak after undergoing a medical for the Russian club. The central defender would have received a reported £3 million salary package for a single term in Moscow, but he has now revealed that talks have broken down. Terry began his career in the West Ham youth system, before moving across London to Stamford Bridge at the age of 14. He went on to play more than 700 times in a glittering spell with the Blues, winning five Premier League titles as well as the club’s first ever Champions League crown in 2012-13. The defender was also capped 78 times for England before announcing his international retirement in2012, representing his country at the 2006 and 2010 World Cups.